For quick and easy shelter needs in all types of weather, try the E-Z Up Hi Viz Canopy Instant Shelter with included sidewalls. 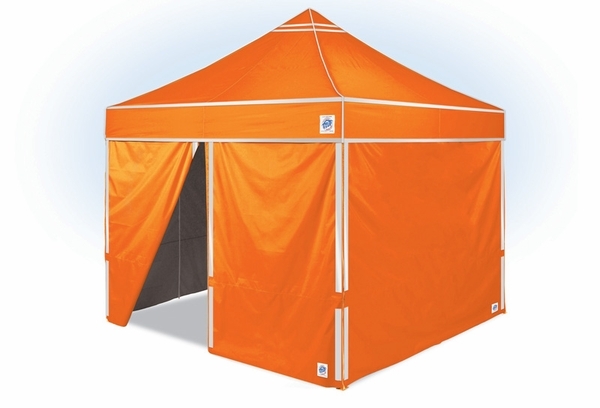 The E-Z Up Hi Viz Instant Utility Shelter is fantastically designed for super quick and easy set up and take down in all outdoor settings. The included Sidewalls allow extra coverage and security in harsher weather conditions. The Hi Viz Instant Canopy Shelter features a super sturdy frame that can be set up in a matter of seconds using the Pin Pull Slider. The Toggle Leg Adjustment system also helps to make assembly simple and safe. Attach the included Sidewalls for additional coverage and closure. Loved this product! It is highly visible and very strong. It held up when all other shelters were blown over!